BGT 8.0 has begun! It’s our fourth year at PS75, and we’re so glad to maintain the relationship. Many of our new fifth-grade playwrights saw the 2017 production, so they came in hungry to write. We’re also hosting BGT at IS77, a middle school in Ridgewood. It’s our first time working with sixth graders– an exciting new challenge! We started by thinking about what we love about our own homes and neighborhoods, and what we wish could change about them. We were introduced to the basic parts of a play and tools of playwriting. We wrote short dialogues and shared them with each other, establishing what will become our regular structure of writing, sharing, and receiving feedback. We have wonderful groups of students at both schools, and we’re already looking forward to producing their plays in April! The week began with a presentation by Markeya Thomas from Climate Nexus, who taught us about hurricanes; in particular, the recent storms that devastated Houston and Puerto Rico. We learned about how global warming makes hurricanes stronger, and how disasters make social and racial injustices more pronounced. Half of Puerto Rico remains without power! The next days we got on our feet to understand the basics of global warming by building our own life-size climate model, and then wrote rough drafts of plays inspired by hurricane-related problems we learned about from Markeya. By the end of the week, we had the beginnings of some rich and imaginative new eco-plays! This week we rode the Staten Island ferry across our historic, polluted harbor for a field trip. We met Tanasia Swift from the Billion Oyster Project who taught us about our sewer system, threats to our waterways, and the promise of filter-feeding oysters. Then we visited the home and studio of eco-artist Tattfoo Tan who led us through several unique exercises intended to unleash our imagination in order to overcome obstacles. He also introduced us to his chicken, 5PM (PM = Poop Machine)! The sun came out on our ferry ride home, revealing the stunning panorama of New York City, our collective home. This week we were visited by Urban Park Ranger Erinn White who taught us about our non-human neighbors and how they make their homes in a city built for humans. 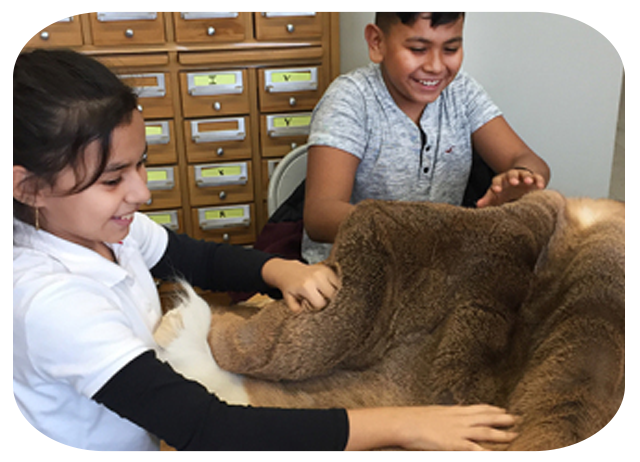 We pet real deer hides and hawk talons, played a game to understand how birds lose their homes to human development, and learned about some of the ways our coexistence with animals can cause problems, like beaver dams in Staten Island causing houses to flood. Ranger Erinn also inspired us with her own story: how she combined her two passions (biology and anthropology) to become a park ranger, and how she now spends her days rescuing animals and educating New Yorkers about, i.e., the harmlessness of raccoons. Naturally, our plays this week were populated by a menagerie of characters. We can’t wait to see which ones get chosen for production! This week our fifth and sixth graders faced some tough questions that trouble many skilled policy makers and community leaders today. How can we make our community better? How can we create a fair, sustainable community that allows for the opportunities of growth and the optimism needed for resiliency? We were visited by Nilda Mesa, the sustainability and equity director Urban Design Lab at Columbia University, who told us her family’s story of immigrating from Cuba to the U.S., how she developed her passion for ecology, and her experiences flying in fighter jets and creating environmental policy with the Mayor of NYC. 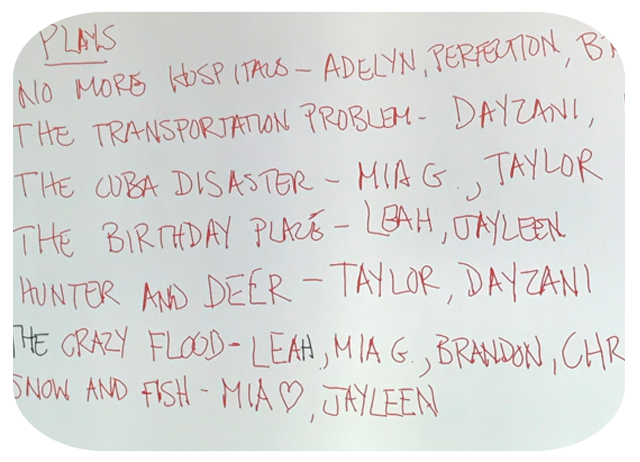 Our fierce BGT playwrights dove into these issues head first (after learning many real life examples) to think about the problems in their own schools and the problems in their community. They role-played as principals and policy makers for their school, thought about the ways they could better their neighborhoods and brainstormed what-if questions to create a semi-realistic universe that was struggling with one of the above 4 topics. Eventually, these what-if questions embarked the journey of writing some pretty amazing, science-fiction like plays. We can’t wait to see what next week’s topic covers. This was a BIG week for our BGT playwrights. It was finally time for the play selection! The playwrights wrote down the 4 plays they had worked on since beginning BGT and then narrowed it down to their top two favorites. Votes were cast, semi-finalists determined and eventually finalized to make for a 15 play extravaganza between the two schools. These plays focus on the 4 topics the writers have learned about in the past few weeks: Hurricanes, Harbors, Habitats, and Hope. Now the writers get a nice little winter break before fleshing out their plays. This week local playwright Nissy Aya came out and talked with kids about the best strategies for re-writing plays. The kids read some of her work and focused on making sure conflict, setting and themes were clear to the audience. Then, our student playwrights jumped back into things, working on finessing and finishing their plays. At the end of the week, they went through their work with their classmates and shared “Glows and Grows” in order to go back, strengthen and tweak the final product. 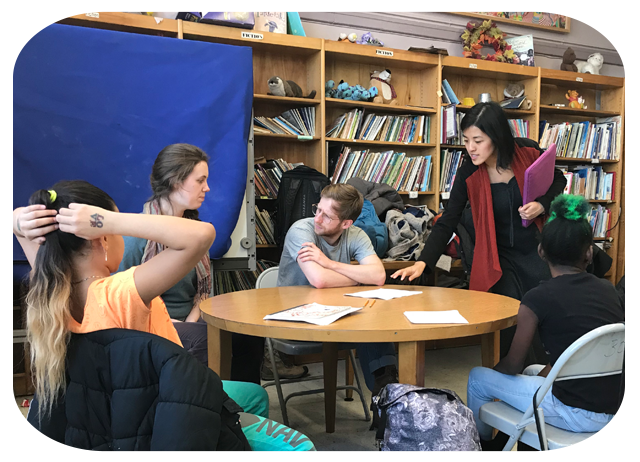 Can you believe we’re only a few weeks away from our student playwrights passing off their plays to The Bushwick Starr for design, rehearsal and production?! Another exciting week! We had our first songwriting workshop with BGT composer Wesley Zurick. Students identified the best moments in their plays for a character to break out into song. They decided the songs’ genres, and wrote lyrics and rhymes. Then Wes explored on a piano what each song might sound like, and gave students small assignments to work on for the next time he comes into the classroom. Students’ songs will be included in the final production and performed live with a three-piece band! This week at BGT was SO much fun. The kids got to learn about theater designers (scenic, props, lighting, and costumes) and begin to imagine how their plays are going to take form on the stage. Each designer introduced what their job entails and how they enhance the story being told. Our playwrights were mesmerized thinking of how the color of lighting affects the mood, how set and props and costumes work together, and how sound could create dynamic layers in the performance of their plays. 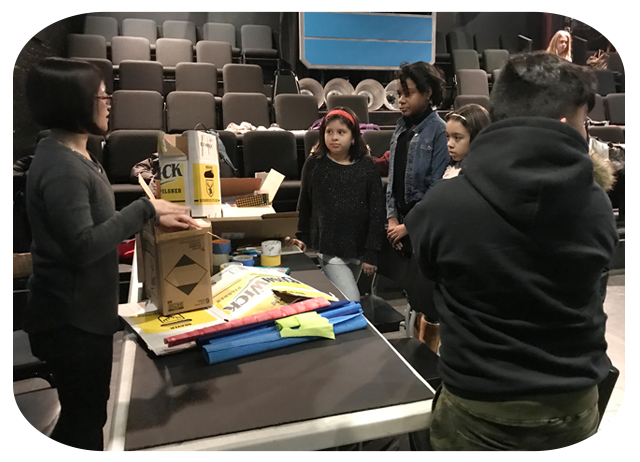 After each designer presented, the young playwrights got to work on building their own sets and designing costumes to experience how designers take their ideas, create models or layouts, and then transform them into the theater. In our second to last week of BGT, our student playwrights focused on re-writes, re-writes, and more re-writes. Our songwriter, Wes, returned to help provide the students structure and more ideas for their songs. He sat down with each play to double check that their song was in the right spot. The students also focused on making sure each moment of their play was earned, character development was rich, and the conflict was clear. It’s hard to believe that next week is our final week of BGT and that we’ll be closing out the writing portion of this process. Can’t wait to get these amazing plays onto the stage at The Bushwick Starr! This was a bittersweet week for BGT. It was our last week in the classrooms at IS77 and PS75. The week began with the student playwrights incorporating the last few of their glows and grows and finessing small details in their plays. 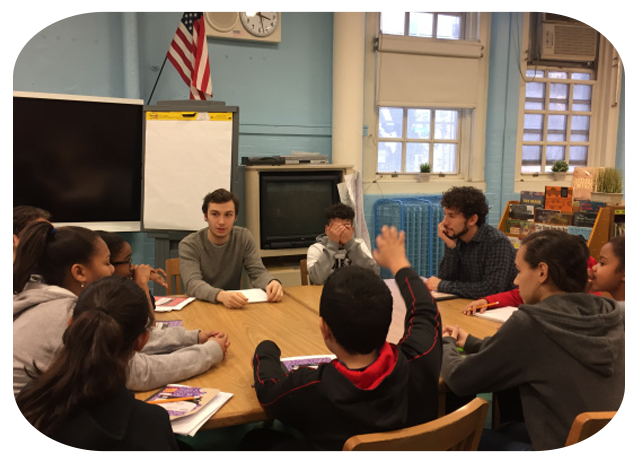 Then each school got to travel to The Bushwick Starr to hear our company of actors read-through their plays for the first time. Wes, our fearless song-writing leader, even surprised the students with some demos of their songs. Everyone was so excited to hear the plays aloud for the first time and to begin to envision what the final product will look like. We will miss seeing our student playwrights every week but we can’t wait for them to return at the end of the month to see how their plays turned out! Rehearsals have kicked off fast and furious for Big Green Theater this week. Our actors started the process by receiving a presentation on the material our student playwrights learned that inspired each of the plays. Then, they developed gestures to establish the environment and youthful energy of the shows. It’s been a busy week of staging, singing songs, and learning lines but our team of actors have fearlessly taken on this year’s wild and exuberant eco-plays. We cannot wait to jump back into rehearsals next week, and for our students to return at the end of the month to see their productions! This week our BGT ensemble moved into the Main Stage theater space at The Bushwick Starr to continue rehearsals! We focused on going through staging for each show and ended the week with a run-through of the whole production. We also practiced our choreography for all the songs and blocked the transitions between plays. Did you know our set creates a giant game of lava for our actors? Come to BGT in less than two weeks to see it! We can’t believe Big Green Theater is nearing the finish line! It was a week big week for our BGT cast and crew because it was tech week! This means that we spent lots of time making sure the light cues, sound cues, costumes, props, and set were perfect for our student playwrights to come next week and see their work! Did you know that Big Green Theater rehearsals are green? This means we eliminate waste by cooking our own vegan dishes, using real plates and cups to cut down on paper waste and even using lights powered by solar panels. It was especially important to make sure our rehearsals were green this week since Sunday was Earth Day!!! We are so excited for BGT to perform this upcoming week and we can’t wait for you to join us and see the wonderful plays written by PS75 and IS77 students. Public performances are April 28 + 29 at 1pm and 4pm. All shows are FREE and followed by a pizza party! You can reserve tix here. Wow what an amazing week! It started out with the student playwrights, along with their teachers and peers, making their way over to The Bushwick Starr to watch the final plays live on stage. Everyone saw the hard work they had put in for three months transformed into a full-fledged production, and it was a very proud and empowering moment. We held reflection parties with the students to get feedback on the plays, the lessons they learned, and their overall experience of BGT. Then, at the end of the week, we held public shows with pizza parties for the playwrights, their family and friends, and the community to experience the joy of BGT. We learned so much from this group of students this year and we’re already counting down the days until BGT 2019!